Server2Go is a web application server that comprises of Apache + PHP, SQLite, MySQL and Perl. You can use it as a portable web development environmen, or to distribute standalone web applications. A web browser will be launched that defaults to the server home page. Note that closing the browser will automatically shutdown the server as well. NOTE: the current stable version is 1.7.3 and NOT 1.8.0 as the headline indicates. However: You may "purchase" access to the development version 1.8.0 by donating an unspecified amount of money, if you wish to (or by buying something from the author's Amazon wish-list). do you planning to implement supporting of Python Cgi? Sorry to say that this packkage cannot be run without admin rights ! Every WAMP package (e.g. XAMPP) can be used as normal user. 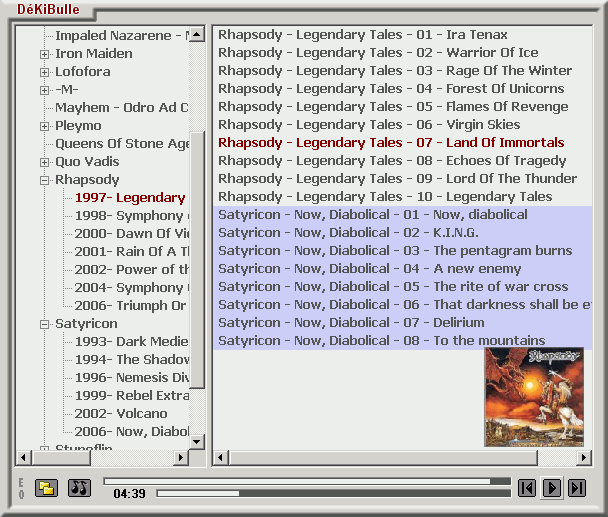 DéKiBulle is a skinnable minimalist audio player that resides in the system tray. This directory-based player works best if you have your music files grouped by folders/subfolders named after the artist and/or album. Hotkeys are used extensively to control the player. Where possible, DéKiBulle uses relative paths when saving the playlist. How to extract: Download the ZIP package and extract to a folder of your choice. Launch DeKiBulle.exe. To add music, right-click and choose manage folders. I agree with Woko in the sense that a menu of loaded platlist with the possibility to load and unload play lists to the menu do not exist. This is a very important item I hope there will be fixed in nexts updates. Great program! By the way: how to upload skins? Win32Pad is a small Notepad replacement with a number of additional features, such as recent file list, line numbering, auto indent etc. It can deal with both Windows and Unix text file formats, and file size is limited only by the available memory. It can also be minimized to the system tray. Unicode support: Partial. It is unable to deal with Unicode filenames, but is able to display Unicode content. How to extract: Download the ZIP package and extract to a folder of your choice. Create an empty file called "win32pad.ini" in the same folder. Launch win32pad.exe. My current preferred notepad replacement, after swapping the hideous default icon with the the vanilla one from notepad (TY, ResHack). Shame it doesn't do text case conversions, then it would be perfect -- as it is, I use a well known commercial editor for heavy duty text editing and nfoPad (totally portable from v1.56, see post @ http://www.portablefreeware.com/forums/viewtopic.php?f=4&t=5409) for nfo file viewing. 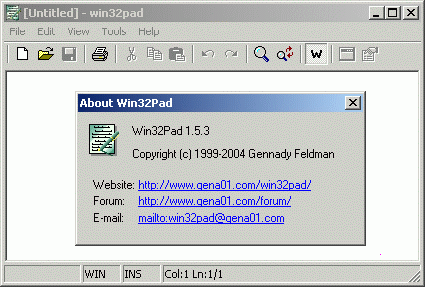 For the rest, Win32Pad is lightning fast and perfectly fit for the common text checking/light editing tasks. I don't hesitate to recommend it! Just thought I'd mention that some of these viewers contain translation fonts. A while back I extracted an ANSI/NFO viewer (don't recall which one... maybe getDiz), located the fonts and placed them in my system/fonts directory. This makes any editor ANSI-capable because the work is being done by an external font. Thought I'd mention it in case your main editor supports font-toggling (toolbar button allowing a quick switch between two system fonts, example: metapad) in order to avoid switching editors just to view some of the text 'graphics'.